From before, I wanted this. Dedicated machine of electricity are sold in about 2000 yen. But, it appears to are too fragile. 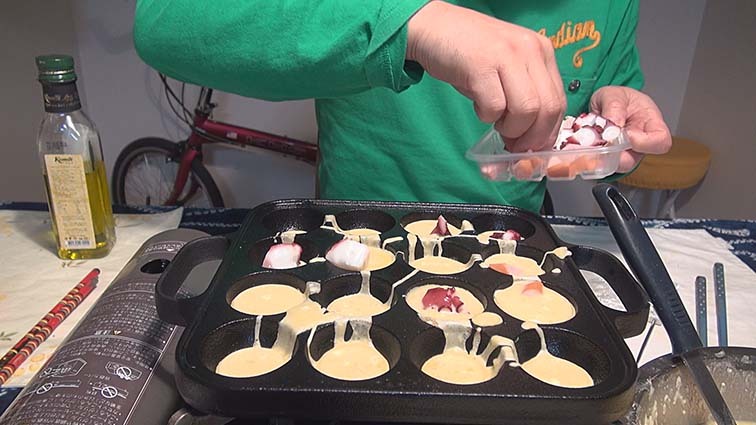 Hot plate that can make takoyaki are also sold. But, I have a hot plate already. It is not replacement by purchase because it is available. On the weekend, I went to the department store. This is because the wife to buy cosmetics. I also went to the kitchen department. Tako-yaki pan was sold in there. 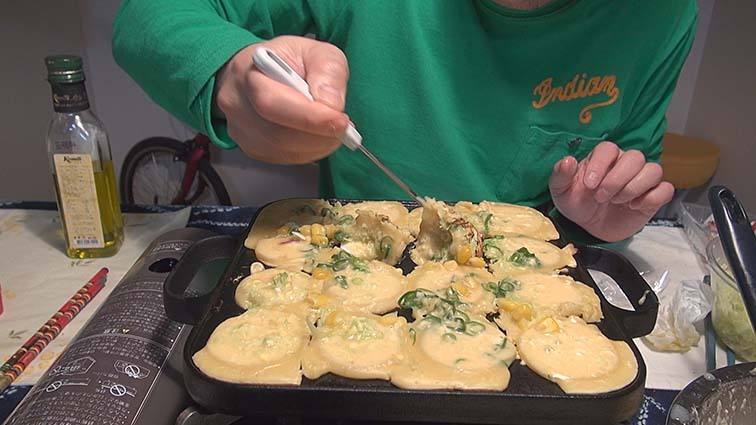 This is the type to put on top of the stove. But, this is not easy. But, it was thin when see well. The price is more than three thousand yen. Deciding factor is storing characteristics. That night, I used immediately. In the basement of the department store, I bought an expensive octopus. I could not find the tempura with pickled ginger. Well, the main ingredients is of course octopus, but I wonder what else. I have prepared cabbage, green onions. And, cheese and corn and wiener. 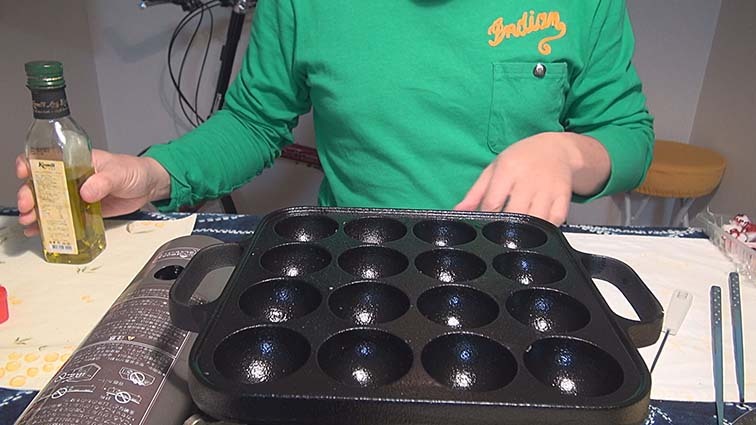 To heat the Tako-yaki pan. Then,a generous amount of oil. There was only olive oil. I put half the dough into the hole. Dough of the hole has hardened. I will also put wieners. I also put green onions and cabbage. I put the dough also from above. It turns over after little time's passing. Ｉt turns over approximately a half. The overflowing portion is gathered up and it forms round. It is quite natural that it should be so. Is it because dough is insufficient? It was not able to make same as sold at the store. Outside is crispy ,and inside is soft. Dashi and soy sauce were put into dough. A fragrant smell, and taste of soy sauce. A Vienna sausage, a corn, and cheese are also good. These ingredients and flour are the same as pizza. Although this is soy sauce flavor. 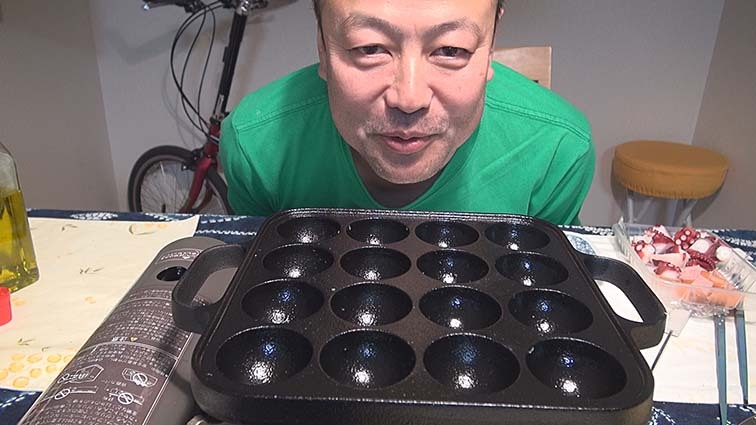 Since the tako-yaki pan was got, it is happy after this. I would like to make from various ingredients. It seems to be pleasant. 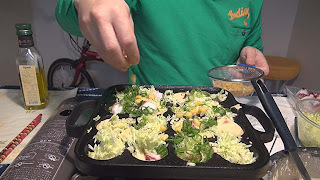 It was few cases to use a cabbage, although I investigated and understand later. 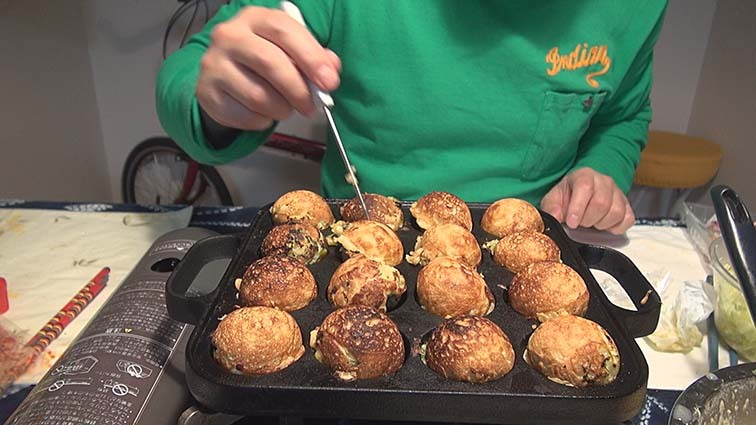 Delicious Tako-yaki have an unnecessary cabbage. It was said that a cabbage was a wrong way. My Tako-yaki life was a wrong way from the beginning.